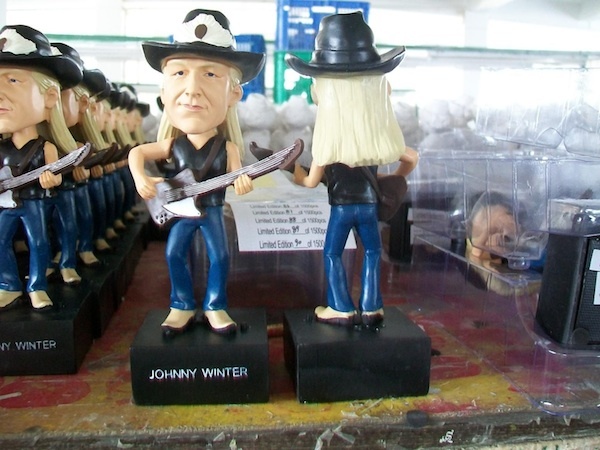 Displayed in a window box, here Johnny is not only accurately sculpted right down to his signature black hat, boots, and guitar, but also has movement at both the arm and head, and yells Rock N' Roll at the push of a button. Live Rockpalast 1979 features Johnny and his three piece band live on Germany's famous Rockpalast TV show in 1979... Straight up blues like only Johnny can deliver, lean and mean. Johnny and the band also blaze through some killer covers like the Rolling Stones' Jumping Jack Flash and Suzie Q.
Johnny Winter - Live Rockpalast 1979 features Johnny and his three piece band live on Germany's famous Rockpalast TV show in 1979... Straight up blues like only Johnny can deliver, lean and mean. Johnny and the band also blaze through some killer covers like the Rolling Stones' Jumping Jack Flash and Suzie Q.
Johnny Winter had nothing to prove by the time April of 1979 arrived. Thirty-five years old, he was an established international star and already a decade removed from his seminal 1969 debut-a groundbreaking record followed by an unforgettable appearance at Woodstock, scores of sold-out arenas, a well documented stint in drug rehabilitation, and a steady stream of celebrated albums. But as this performance makes clear, Winter's musical soul wasn't entirely at peace the night he stepped before a massive audience in Essen, Germany, to record a performance for the popular German television program Rockpalast (Rock Palace). The Texan, armed with his Gibson Firebird was on a mission to reaffirm for his audience-including millions watching the broadcast across Europe-his devotion to the blues, the music that consumed him as a young man during the 1950s and '60s but was later cast aside as rock stardom beckoned. The proof can be found in the night's setlist: Hideaway, the guitar workout made famous by Freddie King, kicks things off. It's followed by Messin' with the Kid, a staple of Chicago harp master Junior Wells. Walkin' by Myself, co-penned by another Chicago great, Jimmy Rogers, follows. But it's not just what Winter plays that tells the tale; it's what he says. I hope there's some people out there that get off on blues, he offers. I know we've got a lot of rock and rollers. But you've gotta remember that if it wasn't for the blues, there wouldn't be no rock and roll. And with that, the master goes deep into the Delta, unleashing a breathtaking, 17-minute reading of Willie Brown's Mississippi Blues, an undeniable highlight of this unforgettable night. Winter follows up with Sleepy John Estes' Divin' Duck before attacking Dale Hawkins' Susie Q. Ever gracious, on I'm Ready, Johnny picks up a bass as his bassist fires away on guitar. The arrangement continues for Rockabilly Boogie, a joyous performance replete with some crowd-pleasing showmanship. But then it's back to the blues. Well I know I'm fighting a losing battle, but I'm gonna to try to do some more blues, Winter says. I hope there's somebody out there that might understand what that is and might want to hear a little bit of it.And with that, Johnny delivers a master class medley that leads off with Robert Johnson's Stones in My Passway. The artist finally throws a bone to the rock enthusiasts with a cover of the Rolling Stones' Jumpin' Jack Flash. But it's best to think of this offering as a reward, not a concession. 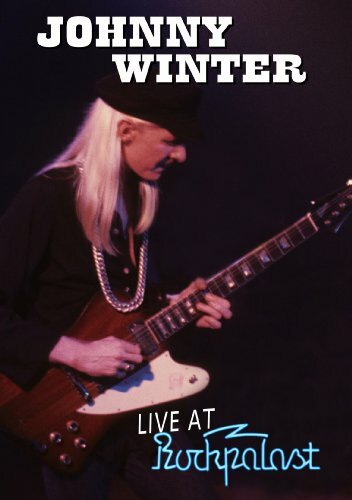 Johnny Winter's statement on this night had long since been made. 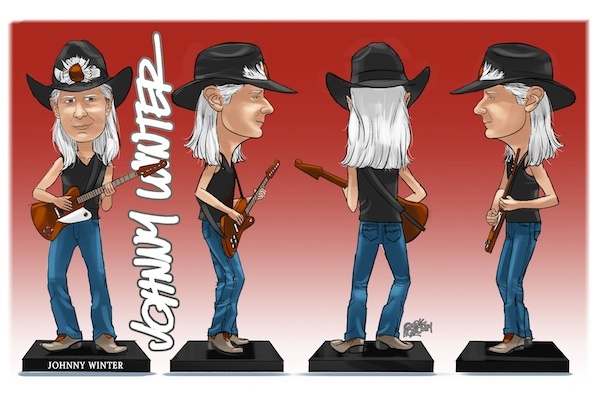 Also, arriving next month is the first figure in the Guitar Gods series... None other than the legendary master blues guitarist Johnny Winter. 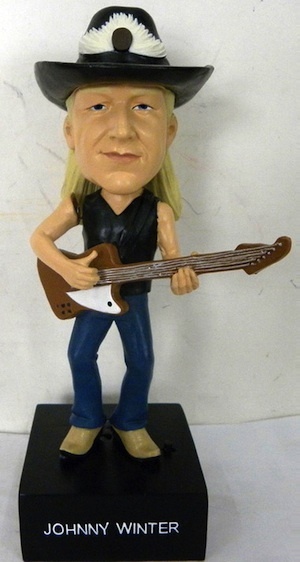 The figure is limited to 1500 numbered units, stands at 7 inches tall, and is made of a lightweight poly resin. Displayed in a window box, here Johnny is not only accurately sculpted right down to his signature black hat, boots, and guitar, but also has movement at both the arm and head, and yells Rock N' Roll at the push of a button!